The destruction of an Il-20M radio-electronic surveillance aircraft with 15 crew members in the late evening of September 17 was not the worst tragedy in the records of the three years long Russian military intervention in Syria but it is perhaps the most difficult one to explain away. Russian Defense Ministry puts the blame squarely on Israel. It was not a technical fault, like with the crash of Antonov-26 transport plane on March 6, which claimed 32 lives, but a surface-to-air S-200 missile fired by the Syrian air defense that brought the plane down. In the morning of September 18, Russian Defense Ministry produced the first explanation of this disaster putting the blame squarely on the Israeli Air Force, which allegedly used the slow-moving Russian turboprop plane as a cover for the strike deliver by four F-16 fighters. It took Israel a few days to disprove this accusation, which has left many awkward questions for the Russian command regarding the real responsibility for the case of “friendly fire”. What complicates this blame game is the conjunction of four setbacks in the execution of Russian intervention. 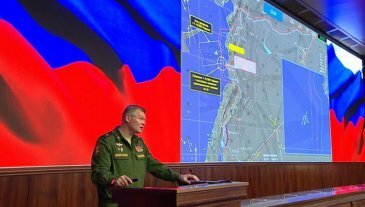 THE FIRST ONE had happened a day prior to the missile hit on the Il-20M, which according to the Russian Defense Minister Sergei Shoigu, performed an intelligence gathering mission over the rebel-controlled Idlib province. A massive offensive by the al-Assad forces on this last remaining “de-escalation zone”, into which various rebel groups, including the remnants of al-Qaeda, had retreated, was set to be launched, when it was suddenly called off. Russian propaganda had delivered many virtual salvos on this “seat of terrorism”, and the pro-Kremlin commentators took much pains to explain the change of plans. The reason for the awkward back-pedaling was the firm stance of Turkish President Recep Tayyip Erdogan, who met with President Vladimir Putin in Sochi after the fruitless tri-lateral summit in Tehran and explained in no uncertain terms that Idlib was off limits for the al-Assad regime. In Putin’s geopolitical designs, the strategic partnership with Turkey is of greater importance than another “victory” in Syria, which cannot generate much domestic enthusiasm. THE SECOND SETBACK affected Russia’s relations with Israel, and Shoigu’s statement about its full responsibility for the tragedy and the forthcoming “adequate responsive measures” was tough beyond reason. It triggered an instant wave of “patriotic” and explicitly anti-Israeli hysterics in the official and social media, and Putin had to expend political capital for calming down the aggressive emotions. General Amikam Norkin, Commander of the Israeli Air Force, presented in Moscow an extensive report on the incident, which left no doubt about the clean execution of the Israeli air strike, but for many Russians such technical details are of little relevance. Shoigu is perfectly aware of this public eagerness to blame Israel, so he persisted with this politically shrewd stance, even if he delivered Putin into a “lose-lose” situation, in which the telephone conversation with Israeli Prime Minister Benjamin Netanyahu was only a means of damage limitation. The sum total of these developments amounts to a profound undermining of the strategic rationale for the Russian military intervention in Syria. Putin declared it victorious so many times that he cannot possibly admit a failure, but neither can he justify an expansion necessary for reversing the trend of accumulating setbacks and mounting losses. He seeks cultivate the strategic partnership with Turkey, wants to preserve ties with Israel (against the preferences of his top brass), and certainly cannot afford the risk of a direct military clash with the USA. He cannot fail to see that the al-Assad regime is an expensive liability, which entangles Russia with the sticky Iranian connection. In the domestic arena, the waste of resources and lives in the far-away Syria has become a focus of discontent driven by the falling incomes and shrinking social benefits. Moscow cannot afford another setback in the unprofitable Syrian enterprise and cannot prevent it in the mutating war, mismanaged by its irreconcilable partners. For the full text, follow this link to the Eurasia Daily Monitor.